Yesterday I added ornaments to the tree I put up in my office Friday night. Even before I finished I got compliments on it. 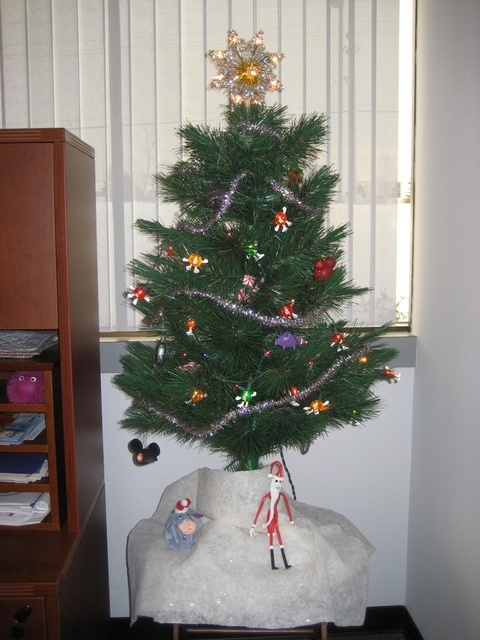 A couple people did say it made them feel like a slacker; they didn’t even have a tree up at home, they said, and here I was with a tree in the office. Those people felt much better when I told them I don’t have a tree at home and don’t plan to have one, that this tabletop version with a dozen ornaments is going to be it for my holiday decorating. One year ago today, there was no entry. Two years ago, I looked back at July. Three years ago, it was Saturday. I wish it were Saturday now. Four years ago, I was thinking about a new car. A couple months later we got the Focus I’m driving now, the one that’s got over 88,000 miles on it. Five years ago, I was feeling Grinchy.